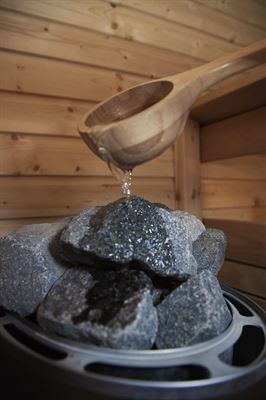 Over the past couple of years, scientists at the University of Eastern Finland have shown that sauna bathing is associated with a variety of health benefits. Using an experimental setting this time, the research group now investigated the physiological mechanisms through which the heat exposure of sauna may influence a person’s health. Their latest study with 100 test subjects shows that taking a sauna bath of 30 minutes reduces blood pressure and increases vascular compliance, while also increasing heart rate similarly to medium-intensity exercise. Previously, the research group has published findings from a population-based study indicating that regular sauna bathing is associated with a reduced risk of coronary diseases and sudden cardiac death (1), hypertension(2) and Alzheimer’s disease and dementia (3). Frequent sauna bathing has also been associated with a reduced disk of respiratory diseases (4) and lower CRP levels (5). The experimental study carried out in the Sauna and Cardiovascular Health project provides new insight into changes that take place in the human body during and after having a sauna. The study analysed the effects of a 30-minute sauna bath in 100 test subjects. In particular, the objective was to analyse the role of vascular compliance and reduced blood pressure in the health benefits caused by sauna bathing. Vascular compliance was measured from the carotid and femoral artery before sauna, immediately after sauna, and after 30 minutes of recovery. These vascular compliance measurements carried out in the experimental study constitute a new assessment method in a sauna setting. Immediately after 30 minutes of sauna bathing, test subjects’ mean systolic blood pressure reduced from 137 mmHg to 130 mmHg, and their diastolic blood pressure from 82 mmHg to 75 mmHg. Furthermore, their systolic blood pressure remained lower even after 30 minutes of sauna bathing. Test subjects’ mean carotid-femoral pulse wave velocity, which is an indicator of vascular compliance, was 9.8 m/s before sauna, decreasing to 8.6 m/s immediately after. During sauna bathing, test subjects’ heart rate increased similarly to medium-intensity exercise, and their body temperature rose by approximately 2°C. The findings shed light on the physiological mechanisms through which health benefits, which have been observed at the population level and are caused by the heat exposure of sauna, may develop. The findings on the effects of sauna bathing on the human body were published in the Journal of Human Hypertension, and the findings relating to the carotid-femoral pulse wave velocity measurements were published in the European Journal of Preventive Cardiology. The study was funded by the Finnish Funding Agency for Innovation, Tekes, and it was carried out by Professor Jari Laukkanen’s research group at the University of Eastern Finland. The project partners were Harvia Ltd., Velha Ltd., Pihlajalinna, Fintravel Ltd. and the Finnish Sauna Culture Association. The test subjects were 100 clients of the Pihlajalinna health care service provider. Their background information was collected by extensive surveys and interviews, and their physical health was measured by a clinical exercise test. The study was carried out in experimental saunas provided by the sauna stove and sauna heater manufacturer Harvia Ltd. The experimental sauna setting was a careful simulation of the way people in Finland take a sauna in their own homes. Research indicates that regular physical exercise and a healthy lifestyle promote cardiac health and prevent disease, but not all of the risk and protective factors are yet known. The benefits of regular sauna bathing on cardiac health observed in the population-based study can, according to this experimental study, be explained by the fact that sauna bathing reduces blood pressure and increases vascular compliance. However, further research data from experimental settings relating to the physiological mechanisms of sauna bathing that promote cardiac health is still needed. 1. Laukkanen T, Khan H, Zaccardi F, Laukkanen JA. Association between sauna bathing and fatal cardiovascular and all-cause mortality events. JAMA Intern Med. 2015;175(4):542-548. 2. Zaccardi F, Laukkanen T, Willeit P, Kunutsor SK, Kauhanen J, Laukkanen JA. Sauna bathing and incident hypertension: A prospective cohort study. Am J Hypertens. 2017; Nov 1;30(11):1120-1125. 3. Laukkanen T, Kunutsor S, Kauhanen J, Laukkanen JA. Sauna bathing is inversely associated with dementia and Alzheimer's disease in middle-aged Finnish men. Age Ageing. 2016; Mar 1;46(2):245-249. The University of Eastern Finland, UEF, is one of the largest universities in Finland. The activities of the UEF underscore multidisciplinarity, and the university is especially strong in research related to forests and the environment, health and well-being, and new technologies and materials. The UEF offers teaching in more than 100 major subjects. In addition to the high standard of teaching, the university offers its students a modern study environment, which is under constant development. The university comprises four faculties: the Philosophical Faculty, the Faculty of Science and Forestry, the Faculty of Health Sciences, and the Faculty of Social Sciences and Business Studies. The university’s campuses are located in the heart of beautiful eastern Finland in Joensuu, Kuopio and Savonlinna. The UEF is home to approximately 15 000 students and nearly 2 800 members of staff.